If your hobby is owning vintage cars, then without doubt you need a place to store them. 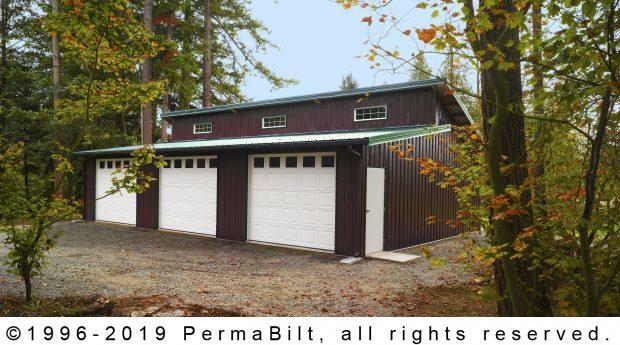 When our Tacoma Washington customer came to us looking for a three car daylight steel garage, he went through our photo gallery and found a daylight garage. He was instantly sold. Didn’t need to look further. He wanted the exact garage that he saw on our website. Having picked PermaBilt® because of our reputation and heritage having been in the business since 1973, we went to work. Daylight garages are designed to take advantage of natural light. Whether with windows or a poly eave-light, the top vertical portion of the roof uses the sun’s rays to light the garage. Additionally, another element used to bring in added natural light was adding small windows or lites on the garage doors. These lites at the top of the garage doors come in a variety of designs from Ashton to Williamsburg or Stockton which our Tacoma customer chose. The decorative lites add a touch of character and functionality that many of our customers like. Our customer was very much hand’s off as he was busy with other endeavors and trusted us to get the job done in a manner that has made us the top post frame construction builder in Western Washington. "Everything looks great. Everyone was pleasant to work with - from the office people to the crews that worked on the building, and all the delivery people. Thanks for a wonderful job."